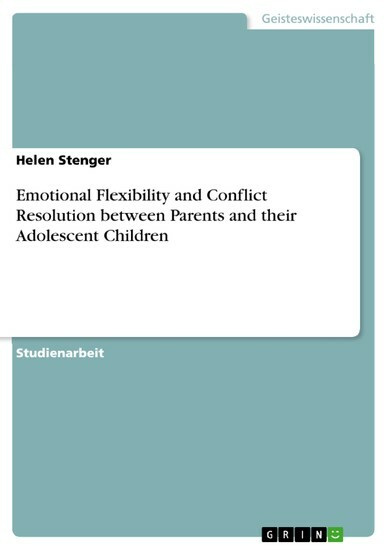 Studienarbeit aus dem Jahr 2015 im Fachbereich Psychologie - Sozialpsychologie, , Sprache: Deutsch, Abstract: The current study incorporates two perspectives concerning conflict resolutions of parents with their adolescent children. The researchers investigated whether the form of conflict resolution ('no resolution, concession or compromise) interacts with emotional flexibility. The participants had consecutive discussions, with different topics in an A-B-A design (neutral, conflict, neutral) and their emotions were coded during these interactions. Using a space state grid the coded emotions were visually inspected to see whether the participants repaired. Repair was operationalized as the transmission of expressing negative emotions (in the conflicting discussion) towards expressing positive emotions (in the last neutral discussion), which could be analyzed by the pattern in the grid. We anticipated finding a group differences, concerning the repair, between the dyads which used a compromise, compared to the other forms of conflict resolution style. Visual analyses revealed that all dyads, which compromised repaired. Nevertheless, almost all dyads which used the other conflict strategies repaired, as well. The implications of this result and additional findings are discussed, concerning emotional flexibility and conflict resolution. The adolescence is an essential developmental period for every individual, which causes changes in various components of life. One part which is specifically affected is the relationship with the parents. This emotional connection is challenged by the experienced conflicts. Inevitably, the opinions of the two individuals may differ extensively, concerning conflicting topics, such as duties at home. Nevertheless, there are certainly moments adolescences enjoy with their parents. Every child experiences these nice times with their parents, when talking about vacation or when philosophizing about the future. However, in order to be able to switch from a positive conversation about leisure time to a negative discussion about homework, you are flexible in your emotion, which constitutes emotional flexibility. Die Ausbildung von Weiblichkeit(en) und Männlichkeit(en) über somatische Kulturen.